Railroads and transit agencies need to keep their trains moving 24/7. Stopped trains can cause lost revenue and unhappy customers. Since the early 1980's we've been working with rail and transit customers to provide robust and reliable wayside power solutions to ensure 100% uptime of critical equipment. 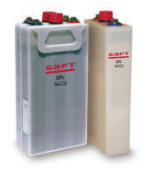 Saft Nickel Cadmium (Ni-Cd) Stationary Batteries offer you the peace of mind of knowing that they will work when you need them to work, for up to 20+ years, in challenging conditions, with very low maintenance. The Arthur N. Ulrich Company is the exclusive manufacturer's representative for SAFT Batteries for the North American rail/transit markets. Saft SPL+ Ni-Cd batteries are designed to guarantee the complete reliability of signaling and railroad system communication. The SPL+ features excellent electrical performance, high resistance to electrical and mechanical abuse, 20+ year lifetime and very low maintenance. The SPL+ powers railroad trackside signals, flashers, switches, communications and other equipment over long discharge periods. Saft SUN+ Ni-Cd batteries are the perfect solution for remote installations that rely on various sources of power generation, such as solar pv, wind-turbines and diesel generators, used under the most difficult environmental conditions for long life performance and very low maintenance. Saft TLX Ni-Cd batteries deliver exceptional reliability against unexpected outages for railroad trackside installations and substations where continuity and reliability of power supplied is critical. 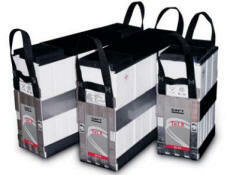 TLX batteries are especially suited for installation in tight spaces and are compatible with VRLA charging systems. 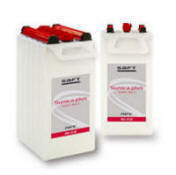 Saft New Uptimax Ni-Cd batteries are the latest generation of Uptimax nickel pocket plate technology and the first Ni-Cd solution that is a perfect plug and play replacement of lead-acid thanks to its 1.39V/cell single level charge. 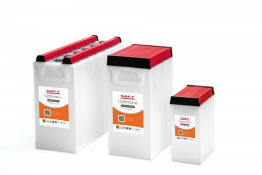 The Uptimax battery is designed for typical power backup applications including UPS, substation switchgear, process control systems, emergency lighting, fire alarms and security systems. 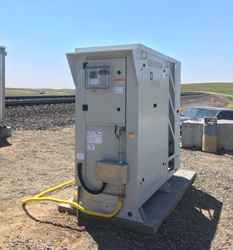 La Marche Railroad Battery Chargers are purpose designed for the demanding requirements of railroad wayside signaling and communication applications, as well as multi-use battery chargers for rail and transit maintenance shops. The Arthur N. Ulrich Company is the exclusive manufacturer's representative for La Marche Manufacturing for the North American rail/transit markets. The La Marche A75R series is purpose designed for harsh rail applications and utilize robust and reliable SCR charging technology. 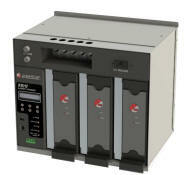 The A75R is capable of charging VRLA, flooded lead acid and nickel cadmium batteries. 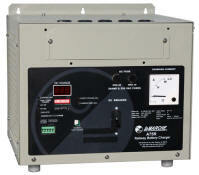 The A75R is packed with value-added features to make a customers DC system more reliable. significantly reduced sizes and weights. The La Marche SC3 (Single Cell Battery Charger) is a portable charger that restores batteries lost capacity, balances specific gravity and reverses the sulfation process that is known to degrade battery systems health. 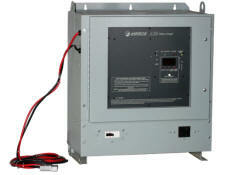 The charger offers the flexibility of charging single, two or three lead acid battery cells. 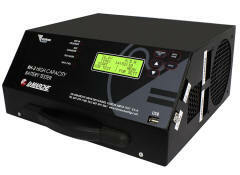 The all-new La Marche MRHF high frequency railroad battery charger was developed as a result of customer and industry feedback desiring smaller, lightweight battery chargers with enhanced communication capabilities, redundant "swappable" modular designs and convenience features like auto input, data logging and remote shutdown. 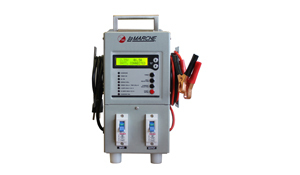 The La Marche RH-3 Portable Battery Tester is an electronic capacity tester that measures AmpHours and battery performance under controlled test conditions. The RH-3 can be operated in several test modes, which provide the flexibility to test each battery according to its own ratings or an application's requirements. The La Marche A39 universal SCR battery charger is designed to provide the battery charging flexibility desired for maintenance and locomotive shops with various charging requirements. Since the early 1980's - RedHawk Energy Systems, LLC has helped railroad customers tackle their critical prime and back-up wayside power challenges with fully engineered and innovative solutions ranging from a few watts to several kilowatts. We can provide reliable prime and backup power systems for highway crossings, intermediate signals, control points, track circuits, slide fences, PTC upgrades, AEI devices, hot box detectors, switch machines, cameras and surveillance, disaster preparedness and much more! Our Solar Power Systems provide a reliable and proven source of DC power by converting sunlight directly into electricity. Solar Power Systems are a reliable and economical solution for wayside applications. 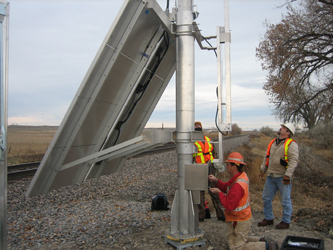 We've been providing Solar Power Systems to the rail market since the early 1980's and offer a variety of mounting configurations including our patented RP Series Retractable Mast (below) to meet virtually any budget and/or site requirement. Our innovative RP Series Retractable Mast is the industry pioneer railroad solar mounting solution that provides a safe and convenient means of mounting solar arrays to a pole structure at ground level, eliminating the need to have a boom-truck on-site for periodic maintenance, troubleshooting or panel replacement. The system can be raised and lowered via a hand-crank or power drill for safe and easy operation. Our robust Battery Boxes are perfect for wayside applications where space constraints in existing bungalows may require battery storage elsewhere. Constructed of all-welded aluminum (steel constructon also available) and featuring fully insulated panels, these battery boxes provide excellent protection for your batteries. We offer several standard sizes and can provide a high level of customization for any site requirement. Our Solid Oxide Fuel Cells (SOFC) provide a reliable source of DC power by converting chemical energy into electricity. 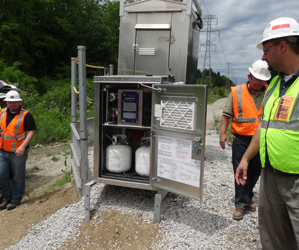 Powered by low cost and readily available propane or natural gas, a SOFC is capable of providing days, weeks and even months of reliable, clean, extended-run backup power protection to highway crossings, intermediate signals, control points, hot box detectors and much more! Our PowerGen Remote Power Generator combines the high efficiency Free Piston Stirling Engine (FPSE) technology with advanced combustion capabilities to efficiently transform propane, natural gas or well gas into dependable power in the 4kW to 6kW range. Stirling Engines are a long-life, zero-maintenance alternative to maintenance-intensive gas/diesel generators used at control points and other high power wayside applications. Our Micro-Wind Turbines (350W & 1250W) provide a source of DC power by capturing the energy of moving air and converting it into electricity. 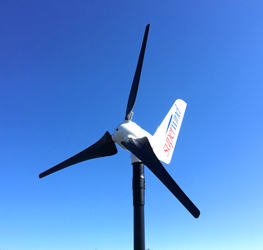 Micro-Wind Turbines can be combined with other power generating technologies (solar, fuel cell, stirling engines) to increase reliability and provide supplemental power to intermediate signals, control points, track circuits and much more. Railway Systems Suppliers, Inc., (RSSI) is a trade association serving the communication and signal segment of the rail transportation industry. RSSI's primary effort each year is to organize and manage a trade show for its members to exhibit their products and services. National Railroad Construction & Maintenance Association (NRC) is the only trade association organized specifically to serve the needs of railroad contractors, suppliers, and the entire railroad and rail transit construction industry. Railway Supply Institute (RSI) acts on behalf of the largest and smallest suppliers to North American freight and passenger railroads. RSI represents a diverse group of rail suppliers involved in the manufacture of products and services in the freight car, locomotive, maintenance-of-way, communications and signaling, and passenger rail industries.